If you've been into the trance scene for a long while, then M.I.K.E. Push will need no introduction. Going under a million aliases, most notably M.I.K.E., Push, and Plastic Boy, he has become most famous for his 1997 smash trance hit "Universal Nation". He has since been incredibly prolific, pumping out tune after tune, year after year, for over two decades at this point. On the very first day of 2014, he announced he would be combining the two most popular aliases of his career into one identity: M.I.K.E. Push. Surprisingly, his first release as the progressive trancemaster M.I.K.E. Push wasn't even a commercial one — it was released on SoundCloud for free for reaching 20,000 followers on Facebook and 33,000 on Twitter, the latter being an odd milestone. 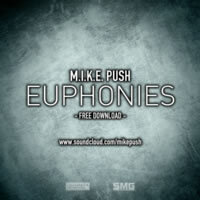 Euphonies is its name, and it's a one-track pony indeed. Starting right off with a slicing snare that could easily chop a few heads off over a grinding bass, it's the saw, the SAW, that cuts you in the heart with a sharp techy melody. It'll make your ears perk up a bit. It doesn't stick around very long, passing on the baton to an average trance bass'n'beats combo afterward as the bass jabs along. Sure, the melody eventually returns, and it's an adequately techy tune to keep clubgoers shaking, though it really doesn't lend itself much to be listened to repeatedly. It's slightly haunting, actually, verily suited for perhaps a trance-based Halloween soirée. This is an interesting way for M.I.K.E. Push to debut his new mutant alias, and now just in how he's delivering the very first track. Euphonies, while not a terrible track, won't go down in the annals of history as one of his finest, one of his most memorable, or one of trance's footnoteworthy entries as a whole. You get what you pay for, I suppose.